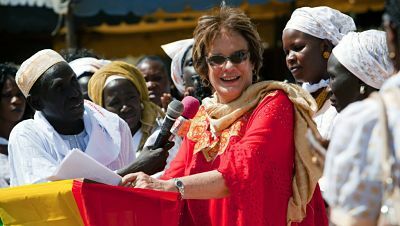 DAKAR, Senegal – When Molly Melching arrived in Senegal in 1974 as a part of a foreign exchange program, no one could have guessed the impact she would have. Through her organization, Tostan, Melching has reinvented global education. In Wolof, Senegal’s national language, Tostan means ‘breakthrough.’ The organization’s breakthrough takes the form of the innovative Community Empowerment Program (CEP), which approaches women’s education through community discussion. The traditional teacher-student roles do not exist. One facilitator, normally a native, introduces new ideas and concepts in the participants’ native tongue. As a result of this system, communities are taught to take their development into their own hands, creating sustainable Community Management Committees that are responsible for the village’s wellbeing. Tostan believes that “every human being – man, woman, and child – has the right to human dignity.” Implemented in eight African countries, CEP consists of three pillars: “Human rights-based, respectful and inclusive, and holistic and sustainable.” It begins with a module structured to foster open and comfortable discussion on the main concepts of democracy, human rights, and health. Utilizing oral tradition techniques like song and theater, the discussions allow dialogue to occur about new and uncomfortable topics. All information is introduced without judgment, and all participants are included in all decision-making. The participants are taught to problem-solve and come to their own conclusions, generating a sustainable learning community. For years, Melching and her team steered clear of the deeply engrained and taboo ritual of female genital cutting (FGC), called “the women’s tradition” by many of the communities. This harmful practice caused many childbirth and other health complications, yet the communities had never recognized these problems as consequences of FGC. As the women became aware of their rights through their discussions, they were the first to speak up. They asked the questions and learned about the health risks this tradition had caused – they took control of their own development. Their approach has been a success. It has been a long process full of triumphs and failures, but today, a remarkable 6,000 communities from eight countries have declared the end to FGC and child marriage with much hope for the future. While visiting Tostan’s headquarters in Dakar, then-Senator Hillary Rodham Clinton made a telling observation. She noted, “Tostan’s approach succeeds because of its deep respect for the people it serves.” The program is never intrusive, exclusive, or unapproachable.